As she nears the end of her second stint as Rajasthan chief minister, Vasundara Raje is rearing to win a third term. She spoke to Deccan Herald’s Tabeenah Anjum on Monday afternoon. 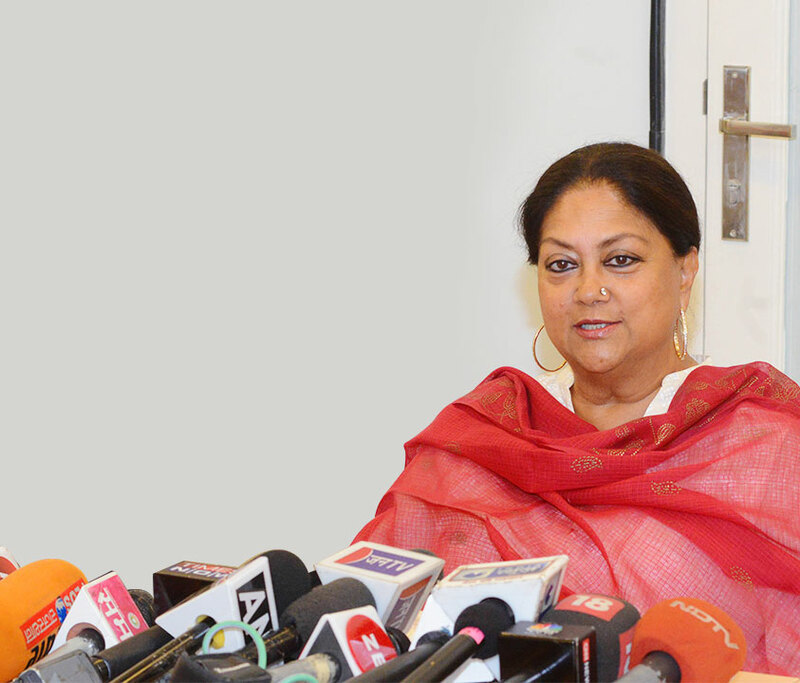 Raje was confident that the BJP would return to power in the state. DH: After four-and-a-half years in power, how many promises and projects have you completed? How has the journey been so far? VR: Well, I think we have completed most of our promises and development projects; some are taking final shape. We came up with 12 successful projects and would like to pursue them till the last day of our government. Some prominent ones are the Direct Benefit Transfer (DBT) programme, the health insurance scheme Bhambhasha Yojna, Annapurna Bhandars, upgrading of ration shops with point-of-sale machines and Rs 5 lakh accident insurance for farmers. Rajasthan is number one in so many things that even in IT, it will replace Bengaluru any day! DH: What has been your main focus in this tenure? VR: Women, education, health and sanitation, and jobs have been my focus areas. I believe that for the development of the state, it’s important that our women are properly educated. It’s the women who can make a difference and I feel it’s our duty to strengthen them. That’s why my government came up with schemes like Rajshri Yojana, in which we gave away free bicycles and scooters to girls topping exams in government schools and colleges. DH: If you are confident that all your development projects have taken shape, why did you feel the need to take out this 40-day Gaurav Yatra, that too when you are in power and polls are three months away? VR: This yatra is not election campaign. Polls are still some time away. This is my third yatra, and there has been a different purpose behind each of them. I took out Parivartan Yatra in 2003 to develop a connect with the masses of Rajasthan. As I was new to Rajasthan, I wanted to understand the place inside out, and there wasn’t any other way to do it. In 2013, the idea behind Suraj Sankalp Yatra was to check what the then Congress government was doing. This time, I am taking out this yatra to see how our schemes have changed the lives of people. DH: After losing two Lok Sabha seats and one assembly seat in by-polls earlier this year, you said during an assembly session, “We will go to the people, work harder and win back their blessing”. Is Gaurav Yatra the way to win back disgruntled communities and regions? VR: Not at all! We have not changed our election strategy. The yatra has nothing to do with the by-poll results. I am sure we will win back the lost seats. DH: The Congress has said they will ask you 40 questions during your 40-day yatra. So far, they have asked three questions and alleged misuse of public money for this yatra, demolition of temples in Jaipur and corruption in the education department. What do you have to say? VR: Instead of answering their stupid questions, I would like to put a big question mark on their four decades in power. Congress has been fooling people. I am not at all concerned what Congress believes. Rather, I am focussed on my party and work. I am not replying to any of their questions. I have better things to focus on. DH: Rajasthan is being called ‘lynchistan’. There have been multiple lynchings by cow vigilantes. What do you have to say? VR: It’s not right to brand Rajasthan as ‘lynchistan’, so many other things also keep happening in the world. As I said in a recent interview with a TV channel, there are so many people and so many jobs are needed to keep them occupied. I have already given 15 lakh jobs and will try to do more. It’s a social issue. DH: What are you doing to appease farmers and other disgruntled communities ahead of polls? VR: We rolled out the biggest farm loan waiver across 33 districts, which will benefit 29.3 lakh farmers. DH: The Congress is working on building a grand alliance. Do you see it happening in Rajasthan? VR: I don’t think they will succeed in doing that. There is no any history of alliance governments in Rajasthan. DH: BJP lost two seats in recent LS bypolls in Rajasthan. How many do you think BJP will win in LS 2019? VR: We won 25 seats out of 25 in 2014. We are hopeful of winning all 25 again in 2019. DH: The Assembly election of 2018 is crucial for you as you continue to be the face of BJP in the state. Do you think you will return to power? How many seats are you confident of winning? VR: When I see so many women at my public meetings, I get the hint that the people of Rajasthan want a woman chief minister once again. I don’t believe in numbers and we haven’t set any target so far. But I am hopeful that we will return to power, and BJP will win 180 seats out of 200.